In this article, I will be discussing as to how you could run a script as a Windows Service. Till now, I am sure you may have encountered certain situations where you will want to run a script periodically for a database update, API call etc. While this can be achieved using Cron Jobs in Linux, there are 2 ways to do this in Windows – either by using Windows Task Scheduler or by creating a Windows Service. Here onwards this article will explain how you can use C# to create a Windows Service that will call a batch file and execute a PHP script. By using this, you can run any scripting language like PHP or a program. Let’s jump right into coding, then! 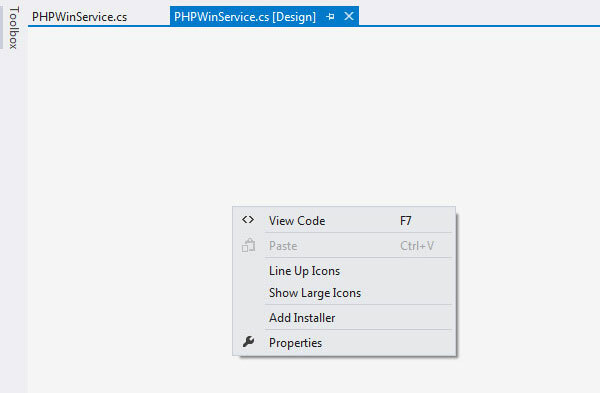 Open Visual Studio > New Project > Visual C# > Windows > Windows Service and enter an application name (for this tutorial I’m going to call it PHPWinService). Fill in the save location. Save the project, keeping the solution name as it is for now. Format the coding as per your preference. 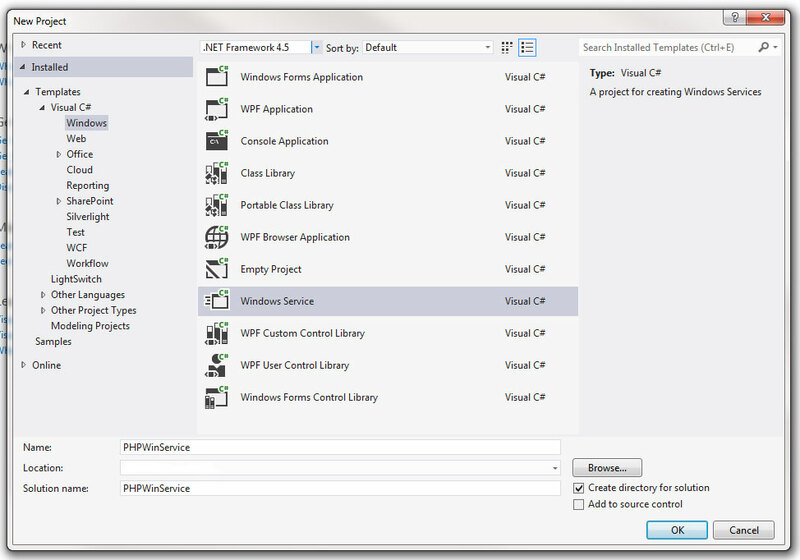 Microsoft Visual Studio will import all relevant libraries and create a template for you to start with. 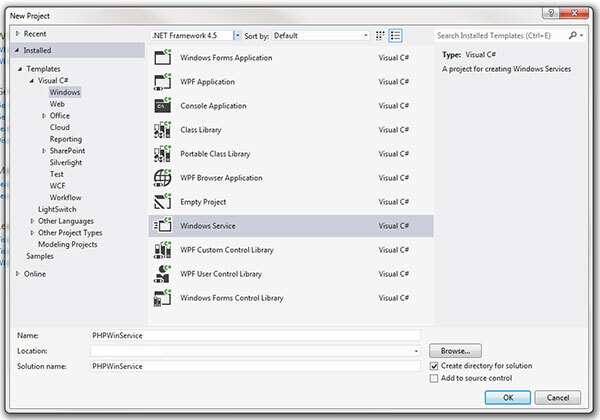 Locate Service1.cs file from solution explorer, click once and change the file name to PHPWinService. Again move to solution explorer and double click on PHPWinService.cs, update (Name) and ServiceName to PHPWinService. Simply speaking, this is what happens when you start or stop a Windows Service once it is installed. Apart from these 4 main methods you can also create any customized method that you prefer in the class body (I will be doing this later on too, by the way). Please note: "functions" are also called methods in this article and how you refer to them just varies from your personal programming background. You may have noticed that the syncTimer variable is prefixed with an underscore (_). This is to indicate that it is a private variable. If I may suggest, I strongly recommend you to use these forms of potent strategies while programming so that it will be easier for you or any other programmer to debug your code in future, if ever it is needed. I will not be explaining above code in detail as I assume that you will be able to understand it, if you already hail from a C# background. If not, please feel free to check out our C# beginner tutorials first. ElapsedEventHandler is a private method, implemented to call processing batch file. Let's combine everything together now! Before we do so, we need to first do a few changes on the settings of our project. Then under Miscellaneous Changes AutoLog to "true" and set ServiceName to PHPWinService. Note that this is very important as ServiceName is the value with which you can recognize your service once it is installed on the Services Manager. 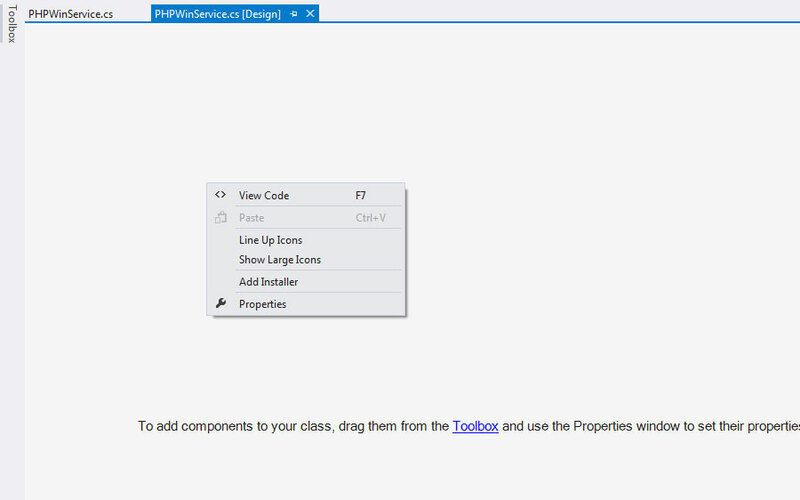 Click on PHPWinService.cs[Design] tab and right click on main window, from pop up select "Add Installer". 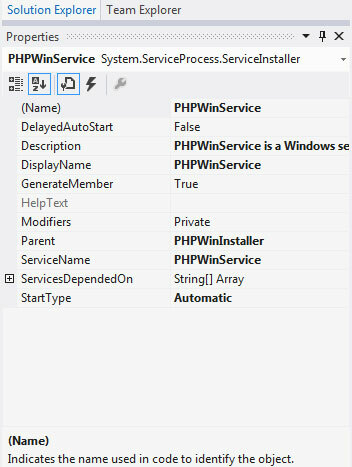 Under ProjectInstaller.cs[Design] tab, click "serviceInstaller1", rename it to PHPWinService from Properties/Solution Explorer((Name), DisplayName and ServiceName needs to be updated), set the StartType to Automatic and add a simple description about the service in Description. Click "serviceProcessInstaller1", rename it to "PHPWinServiceProcess" and set the Account Property to LocalSystem. This will thereby install the service and run over a local service account. Finally, you can build the project as a release version. In the next article, we will go through on how to use installutil to perform a manual service installation/uninstallation.